Some love to run. Some love to lift. What do Americans, in general, prefer? Do muscle-strengthening activities (such as lifting weights or using resistance bands) that are moderate or high intensity and involve all major muscle groups on 2 or more days a week. 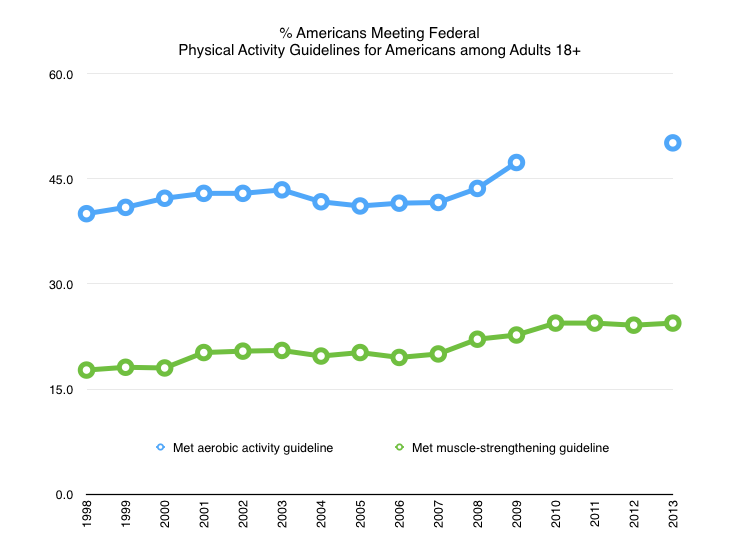 Going back to 1998, the CDC data show that TWICE as many Americans met aerobic guidelines as they did strength guidelines. These numbers suggest that Americans prefer cardio over strength training by 2-to-1. There are many ways to meet cardio guidelines, such as playing tennis and swimming, but strength training variations may be limited or less familiar to most. Share with us, what do you prefer? Cardio or Strength?